I found this HIDEOUS lamp at a local thrift store for $2.00. Poor thing, it can't help it that its maker made it SO UGLY! But luckily, I saw the potential for it and thought,"What a wonderful lamp this would be for my buffet!" So it came home with me, along with a few other awesome items I just had to pick up. So today, i'm going to share with you its makeover, hopefully you'll think it went from hideous to HOT like I do! LOVE THIS COLOR! It's Aqua by Rustoleum. Getting a coat of Ralph Lauren Faux Technique Glaze! There it is, sitting on my UNtouched buffet. Don't you just LOVE IT?! I'm just swooning over how cute it is now. New FAV color? Rustoleum Aqua. Well, and Rustoleum Brushed Nickel. They tie. love the lamp. it turned out great i saw a similiar lamp in marshalls for 40 dollars. I DO love it! :-) You did a fantastic job and now it can be very proud of itself...no more shame for the lamp! You should be proud of yourself too because you are doing some awesome projects. Thanks for linking this up to the party! Gorgeous lamp! Isn't it wonderful to see beauty in the not-quite-yet-beautiful pieces? Love the lamp and the buffet. I stopped over from Donnas SNS. I'd love it if you came by for a visit. I'm a new follower. Love the lamp and the dresser! Love the color you used on on your lamp. Sooo cute!!! Looks amazing! I can never resist a great lamp make-over! Much better! What a great tutorial too. Thanks for linking up! Good job. Painting the whole thing including the base was key. Really cute! I just spray painted a lamp too and I'm love it! Wow, the color really did wonders for your lamp. It's adorable! Very cute!! That color is beautiful!!! I might have to pick that one up and add it to my stash! I LOVE IT!! Gives me some inspiration for a lamp that I have....hmm.... ;o) Thanks!! Cute lamp. It looks fabulous with it's makeover. Can't wait to see what you do with the buffet. Very nice! I have yet to try my hands at lamp refurbishing, and I hate my lamps! It's always amazing what a little spray paint will do. What an unbelievable change. This new lamp has such a sophistication about it. 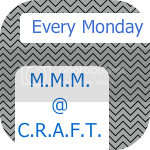 Thanks for linking up to "Meet Me On Monday". But, I was super surprised to see the font I made on your heading...pea noodles girlfriends! Love it--glad to share it around blogland! I am loving the aqua as well - Looks great on this lamp! It is crazy how spray paint and glaze can give something a new life!